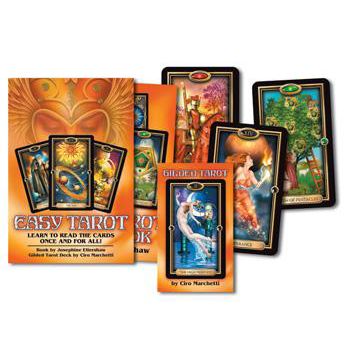 More than just a manual, Easy Tarot is a boxed kit that also includes The Gilded Tarot - a stunningly beautiful and popular deck by the well known Ciro Marchetti. Ellershaw gently guides novices to become proficient, sensitive, and responsible readers. Suit by suit, she introduces the distinct characteristics of the minor arcana, court cards, and major arcana. You will learn how the cards link to one another and produce insightful relationships as their unique energies merge in the Cross of Truth, the Celtic Cross, and other spreads. There is even a list of card combinations that commonly indicate specific events - such as pregnancy, a wedding, a new job, and more. A quick guide to card meanings, sample readings, safeguards, ethical guidelines, as well as tips for keeping a tarot diary, are all covered in this well-rounded introduction to tarot.